In these tough financial times I think it is important for those of us who love to travel to appreciate the small journeys we can take within our own country, state or even city. Plane tickets are expensive, the dollar is still weak and sometime these little trips can be just as exciting as jetting off to a foreign locale. Road trips are awesome, for example. We just got back from one through The Four Corners and it was absolutely amazing. For those of us that live in larger cities such as New York, San Francisco or Los Angeles, I recommend a little day trip to your local ethnic neighborhoods. Some are better and bigger than others, in L.A. Little Armenia seems to span only a few blocks, but then one could get truly lost in the sprawling metropolis that makes up Koreatown. Chinatowns are always nice. 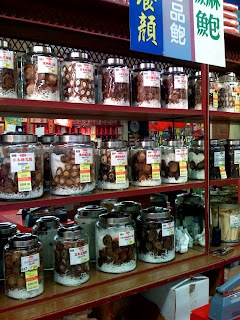 What better way to take a little break from the norm then heading off for a bit of dim sum and a stroll through the shops and emporiums with their jars of indistinguishable but apparently edible spherical brown things, or their myriad of dried sea creatures or barrels of roots of every shape and size. Who among us couldn't while away the afternoon trying to figure out what, "Bird's Nest Drink with Jelly Bits," is, or what the medicinal value of, "Horny Goat Weed Tea," could possibly be. For around $30 you can return home feeling like you've been in the very bosom of China. I'm as optimistic for the future as the next guy, but until I've pulled myself back up to the old not-great-but-decent-salaried-world-traveler-with-a-lot-of-room-left-on-her-credit-cards, that I once was, it's nice to know that there are cheaper and easier options.